Petel, Gilles. 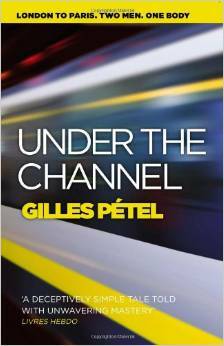 “Under the Channel”, translated by Jane Aitken and Emily Boyce, Gallic Books, 2015. When the body of a dead Scotsman suddenly appears on board a train going through the Channel tunnel at the Gare du Nord, Roland Desfeuilleres gets charged with a murder investigation and as it turns out the crime is inter-city and about changing identities. Roland then decides that it is best to go to London not only to deal with the crime but also to get away from his marriage that is falling apart. The world was going through an economic crisis at the time and when he arrived in London, he found desperately trying to deal with the poor economy. Nonetheless, Roland immerses himself in the victim’s hedonistic lifestyle, as he searches for the motive behind the crime. However, instead of learning about the crime, Roland learns about himself the more he follows the hedonistic lifestyle of the victim. We therefore get a chance to see London through the eyes of a Frenchman and this is something we do not often get in literature. I love dark stories and this is one that is not only dark it is also a bid odd but even with that the characters are ironic and intriguing. Roland is both ironic and intriguing and he is fun to follow through the text. He seesaws between being humorous and being caught in situations that are sometimes quite funny and sometimes border on the unbelievable (for us, that is). He is determined to find and pursue the killer who is responsible for the body on the train and searches the streets of London for him. The investigation is important to him not only for the sake of the law but also it gets him away from his troubled marriage. It seems that his wife is quite a difficult woman. But then, he is also not the easiest man to live with. As Roland learns more about the victim, he also learns a good deal about himself and how he lives. We first meet the murder victim when he is still alive and we read of him as he boards the train for France. What he does not know is that he will get to France alive. Gilles Petel has written five novels but this the first and so far the only book f his that appears in an English translation. We can hope that this book is received well so that his workers will be available to us someday. For me, the real problem I have in reviewing mystery and thrillers is that many times I see a film or read a book before others but I cannot discuss it openly. I never want to give anything away so that is why reviews of this kind of book are usually short. This entry was posted in Uncategorized on December 23, 2014 by Amos.